Super Hero Boy: Classic space invaders! You know its been ages since I watched an black and white film and I really forgot how pretty and awesome they can be, especially in the age where we are spoiled with CGI effects, insane sound effects, and huge budget movies that are over the top. There is just something really amazing about a well done movie when you know darn well compared to the movies of today they might as well be working with a high school budget. Not that I am putting older movies down by any means I'm really endlessly empressed with what people can do with sheer talent and creativity without relying on computers to do your dirty work. With The Day The Earth Stood Still about to hit the big screen some of us may not remeber that its been previously done, though for many of us you may not have seen the previous version as it is circa 1951. Yes ladies that means pre color tvs, pre special effects we know today, and pre Keanu Reeves! Heh how could one possibly survive? You know there is something really cool about Klaatu's 1951 alien outfit. It reminds me a bit of vintage robots and the classic bucket head 1950's space man who just happens to be the insperation to Connor's big boy bedroom that I'm working on. You know its ironic Klaatu's main mission is to stop humans from using atomic power for evil doings this being the age where the atomic bomb was dropped more times than you would like to belive in test runs not to mention using it on live people. Klaatu threatens earth with the possiblity of destruction if we do not use our new found powers wisely. You know other than the whole eliminate mankind over the atomic bomb thing I sorta like this Klaatu guy. He certainly gets to the point and he does seem much smarter than the overgrown apes that run goverment at times. I mean did these guys not listen to their moms when she said "It's not nice to throw things, especially things that destroy everything in its path". Now I'm all reved up to see the remake and it will be fun to watch the classic and new version of The Day The Earth Stood Still with Connor when he gets a little older. You know we watched The Day The Earth Stood Still on bluray and I really was scheptical about a bluray release of a 1950s movie. I mean was it really so important to have high def on a black and white film and would the soundtrack do any justice to bluray's capabilities. The answer to that is YES, and yes! I can't even tell you how goregous it is to see a black and white film in bluray. I didn't even realize just how much detail the older cameras pick up and there is just something classy about black and white regardless if your shooting a alien. One cool extra feature that you can only get with bluray is the included video game Gort Command! which was a blast on my PS3. 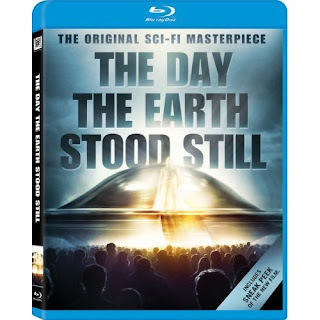 Now I just need to find a way to get myself to a theather to see the new release of The Day The Earth Stood Still. In the meantime you can purchase your own copy of the 1950s version of The Day The Earth Stood Still on Amazon and I have three copies to give away to some lucky readers! Leave a comment on this post. Check out The Day The Earth Stood Still and tell me what is your favorite Keanu Reeves movie or what is appealing to you about black and white movies. I really like the movie SPEED. Thanks for the giveaway. Bill and Ted's Excellent Adventure! my favorite keanu movie is: constantine. i love keanu, he's a hottie. i love the older movies and tv shows. much better than the junk that's out today. i'd rather watch these than any of the new stuff. sometimes, depending on the movie or show, black and white can make it more dramatic and suspensful. The Matrix is my favorite Keanu Reeves movie. The Matrix for me too. I really like the movie SPEED. thanks. I liked the movie Speed. Him and Sandra Bullock were good together in that. Love the giveaway movie and saw it many times as a child. Thank you! Hands down, Matrix. It was the only movie he's ever done that I've been able to watch more than once! Thanks! Oh geez,that's a tough decision! So far I would say Constantine is my favorite...or The Watcher..okay,I'll go with Constantine. I love the movie The Lake House!! When I was a little girl, my dad made me memorize the 'klaatu barada nikto' phrase, because you just never know. Even now it's a bit of a joke with us. We are, of course, intensely wary of the remake. I think Keanu was perfect in the Matrix, but his turn in Bill and Ted's Excellent Adventure is truly one for the ages. That's a hard one, but " Bill & Teds Excellent Adventure" is really excellent! My favorite Keanu movie is Speed. Black & white movies seem to have more character & very often don't translate well into color (Miracle on 34th Street is a good example). Keanu was way cool in the matrix. Loved it when he stopped the bullets. I like the Matrix .. great set of movies! My favorite was Speed. Thanks for the contest! I liked Speed. I always like anything Sandra Bullock is in. My favorite movie is Speed. And about the black and white movies...I love them. There is something classic and romantic about them. Bill and Ted's excellent adventure is my fave! Black and white movies are actually the ONLY movies I will watch on TV. It seems that everything being made today is just retelling of the old black and whites. I like a movie that leaves something to the imagination; like a good book. Bill & Ted's excellent adventure is my pick. I like both Speed and The Matrix. Either one is my favorite depending on what mood I'm in. There are so many black and white movies that should never see a colorizer. The shadows and depth of B&W so suit the mood of the film. This is one of them; Casablanca, The Third Man, and Gaslight are three more that immediately spring to mind. B&W is perfect for them. No doubt on that...Speed with Sandra Bullock! Most of Keanu's movies are pretty poor but I like the Devils Advocate. I am subscribed thru my Yahoo reader. The Lake House is my favorite. My favorite is The Matrix. Theres a bomb on a Bus..what are you gonna do? Bill & Ted's Excellent Adventures, a classic. Speed is my favorite film. Speed is awesome to watch all the time! My favorite Keanu movies are Speed and The Matrix, love him! Thank you! Keanu Reeves is my 2nd all time favorite and I like all his movies from Bill & Ted to Chain Reaction, but my favorite is all of the Matrix Series. I loved him as the handsome doctor in Somethings Got to Give! I'm a fan of Devil's Advocate. Thanks for the chance. Easy choice. First original movie in a long time. I thought Keanu was hilarious in I Love You To Death. Thanks. The matrix was my favorite. B&W movies seem to rely more on storyline and less on flash. I ,loved the lake house!!!! I like several but the movie of the moment at our house is Constantine! The Replacements is my favorite movie. Black and White film lends a stark reality to the details. I like Keanu Reeves in Constantine. Speed is the best Keanu Reeves movie in my opinion. My favorite Keanu Reeves film was the first Matrix movie. It was such a unique movie, and really surprised me with the big twist halfway through the film. It's unfortunate the two sequels were so poor. Thank you for the great give-away. My favorite Reeves film is probably A Walk in the Clouds a nice little romantic film. He did very well in it and I'm surprised he never did much of this type. Speed was my favorite Keanu movie! What is appealing to me about black and white movies is that they take me back to a simpler place in time...like when I was a child. Everyone likes Speed and Matrix, as well as myself. But my favorite movie that Keanu is in is Point Break. I love that movie! My favorite A Walk in the Clouds. The Matrix!! Tell me you didn't freak out the first time you saw it!! My favorite Keanu Reeves movie is The Matrix. The Matrix is still my favorite. Constantine is a family fav! My favorite movie would be speed. I like the way black and white looks on my t.v it's allmost like watching art then a movie. Probably would have to say Devil's Advocate. Being from Chicago, I gotta say Hardball is my favorite. i loved hardball and my husband is a huge fan of the matrix series:) thanks for the chance! My favorite is Matrix, enter me please. My favorite Keanu Reeves movie is Constantine! Great movie! Speed- and he is soooo hot! I like his two sides. The Matrix and Bill & Ted movies are my favorite Keanu Reeves films. Please accept my entry. Thank you. I like both Speed and the Matrix trilogy. I'm not a big movie person, but I liked Matrix. The Matrix, original. Amazing. Didn't even know who Keanu was until then. Now, he's a legend. The Matrix- the first one. I love the elegance in B&W movies! I love the Matrix!! I'm not sure what I love about old B & W films, maybe there was an innocence about them. They left things to the imagination unlike movies today. I don't have a favorite Keanu Reeves film, and I'm not sure I can say I am a fan of black and white films, but I do watch them because there were some great movies made in black and white and many of them have more substance than the movies made today. Bill & Ted's Excellent Adventure!!!! when i was younger that was my friends and i sleep over movie!!! i think i have seen it like 5000000000 times!!!! And I just LOVE Black and White movies!!! they are my favorite! they really add something! The Art of it i think just makes movies better!! the matrix, the first one was my favorite. thanks for the contest! The kids and I enjoy Bill and Ted's Excellent Adventure. I love the glamour of old movies. My favorite Keanu movie is Matrix, but Speed is a close second. Thanks for the chance to win this classic movie! Keanu - now there's some eye candy. Loved Devil's Advocate, Matrix, even Bill and Ted. Have to say my favorite was Speed. My fave movie is Constantine !! And I also feel that black and white movies are mysterious and you don't have a clue what is going to happen next. Thanks for a great giveaway! My favorite Keanu Reeves movie is the Matrix trilogy. Black and white movies have that great classic feel! All I have to say is Johnny Utah!! Wow! Has no one seen 'My Own Private Idaho'? He (and River Phoenix) were perfect in that movie. Speed is my favorite Keanu movie. Bill & Ted's Excellent Adventure is my favorite Keanu movie. My favorite Keanu Reeves movie is A Walk In The Clouds. Thanks! No doubt my favorite is Bill & Ted's Excellent Adventure! I loved the movie Lake House. Thanks for having the wonderful giveaway. A lot of older black and white movies are being remade. I think this is due largely to the fact that the older movies had intensity and substance. They were able to grab you with a whisper and make you shudder by playing with your minds imagination. I have always enjoyed the black and whites over more modern versions. There is some classic style that appeals to most people. I own the Matrix Trilogy. But another one was a movie called Point Blank, I think about surfer robbers.